It is also known as Hutchinson-Gilford Progeria Syndrome (HGPS) and is a rare genetic condition that causes a person to age prematurely. It affects both sexes and all races equally. It affects about 1 in every 4 million births worldwide. Children look normal at birth and in early infancy, but then grow more slowly than other children and do not gain weight at the expected rate. A mutation in the gene, known as lamin A (LMNA), is responsible for progeria. This gene makes a protein which is necessary for holding the nucleus of a cell together. When it gets mutated, an abnormal form of the lamin A protein called progerin is produced and makes cells unstable. Progeria is rarely passed down to families. For parents who had one child with progeria, the chances of having a second child with progeria are about 2 to 3 percent. As children with progeria get older, they get diseases you would expect to see in people age 50 and older, including bone loss, hardening of the arteries, and heart disease. 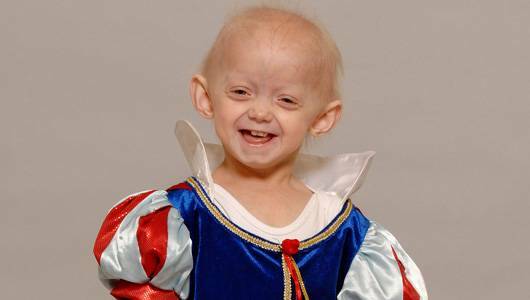 Children with progeria usually die of heart attacks or strokes. The doctor will ask for the physical exam, test hearing and vision, measure pulse and blood pressure, and compare child’s height and weight to other kids the same age. A genetic test for LMNA mutations can confirm the diagnosis of progeria. There is no cure for progeria, but it can be managed by regular monitoring for cardiovascular diseases. Physical and occupational therapy: These therapies may help with joint stiffness and hip problems to help your child remain active. Other Medications: Medicines for blood pressure, cholesterol, to prevent blood clots, and medications to treat headaches and seizures.